On Friday, February 16, 2018, Pennsylvania Governor Tom Wolf, Philadelphia City Councilman Curtis Jones, Jr. and Pennsylvania State Senator Vincent J. Hughes joined Alfredo de la Peña, Chief Executive Officer of Mission First Housing Group, Jeffrey W.J. Wilush, President & CEO of Horizon House and Jamila Harris-Morrison, Executive Director of ACHIEVEability to break ground on New Market West. New Market West is a four story, 135,700 square foot hub for retail and community services on a 1.5 acre vacant site at 5901 Market Street, near the 60th and Market Street El stop in West Philadelphia. The building will bring high quality early childhood education; workforce development, educational and emergency support services; behavioral health services; and community-serving retail to this transit-accessible location. Other distinguished guests included Pennsylvania Congressman Dwight Evans, Pennsylvania State Senator Anthony Williams, Pennsylvania State Representatives Vanessa Lowery Brown, Joanna McClinton and Morgan Cephas, Philadelphia City Council members Jannie Blackwell and Derek Green and Anne Fadullon, Director of Planning and Development, City of Philadelphia. 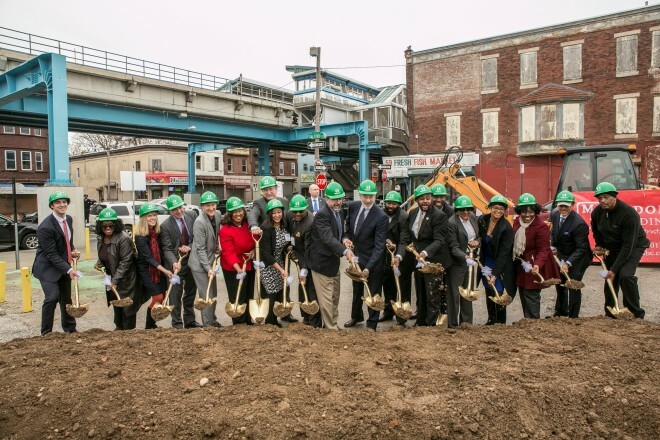 New Market West is an exciting venture for Mission First, as it is an opportunity to build on important partnerships and deepen our commitment to individuals and families in West Philadelphia. Copyright 2019. Mission First Housing Group All Rights Reserved.